In a mega deal that would create the world’s largest steel entity, three times bigger than the nearest rival, Arcelor SA today accepted the improved takeover offer from India-born L.N. Mittal’s group, ending a five-month long battle between the industry giants. 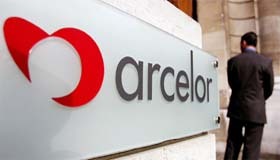 The Arcelor logo is seen at the entrance of the steel group's headquarters in Luxembourg on Sunday. England’s David Beckham celebrates his goal against Ecuador with team-mate Ashley Cole (right) during their second round World Cup match in Stuttgart on Sunday. India’s Special Representative to the India-China boundary talks K. Narayanan and his Chinese counterpart Dai Bingguo have met informally in the north-western Chinese city of Xian ahead of the official-level talks here tomorrow. Former Prime Minister V.P Singh today clarified that Congress President Sonia Gandhi had declined the Prime Minister’s post in 2004 not because of security concerns but because she did not want to give the BJP an opportunity to embarrass the new government on the issue of her foreign origin. The entire Pattan town in north Kashmir observed a complete strike today in protest against the killing of a student and a woman, allegedly in firing by the security forces during demonstrations yesterday, even as the mourners attacked the Pattan police station yet again. 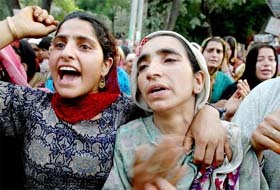 Relatives protest against the death of Tariq Ahmed Sofi at Pattan in Baramula district, Jammu and Kashmir, on Sunday. In view of the sharply shooting prices of vegetables, the Haryana Government sees an opportunity to encourage farmers to diversify cropping pattern and to be less dependent on the wheat-paddy rotation. Uttar Pradesh Governor T.V. Rajeswar dashing off to New Delhi has given rise to speculations of President A.P.J. Abdul Kalam intervening to stave off an impeding clash between the Raj Bhawan and the Allahabad High Court. In the wake of rising terrorist threat, the city police has chalked out a foolproof security blanket for the 129th annual rath yatra of Lord Jagannath to be taken out from the famous century-old Jagannath Temple from the Jamalpur area on June 27. The Ministry of External Affairs received a request from China last year which flummoxed the Government of India and experts alike. Beijing wanted a bust of celebrated Sanskrit poet-dramatist Kalidas to be installed by Shanghai Municipal Corporation which proposes to have a Shanghai Theatre Street shortly in downtown Shanghai to promote cultural awareness of its people.